It may be tempting for a teaching artist to provide volumes of evidence. However, a focused, brief set of one to three quotes can be enough to connect classroom teachers to the wisdom of the field. DEFINITION: What is Establishing Purpose in an arts integration PD experience? Classroom teachers want to know why they are learning new arts strategies, and how they will help students learn. What’s more, teachers often carry a wisdom of practice, and benefit from the opportunity to organize and communicate that wisdom within a professional community. Establishing a purpose involves articulating core beliefs about how effective teaching leads to effective learning. This is larger than a discrete set of learning targets (see Learning Targets), and frames the field of arts integration so that classroom teachers coalesce understanding of the theory, research, policy, or multiple perspectives that support this work. This is the genealogy of the present work: what are its roots, relationships, and possibilities? PURPOSE: Why is Establishing Purpose important to an arts integration PD experience? By establishing the purpose or importance of the work, the teaching artist supports classroom teachers’ motivation and engagement as they begin to value arts integration processes. Novice classroom teachers often characterize arts integration as “fun,” and while bringing joy into a classroom is a powerful purpose unto itself, establishing purpose can also help classroom teachers develop perspective on the power of arts integration to support meaningful learning, positive behaviors, and cognitive skills for their students. To become skilled arts integrators, classroom teachers need a vision for the potential power behind the pedagogy. A framework of purpose (See figure) can also help classroom teachers organize and track what they are learning during a PD experience. For students living in a rapidly changing world, the arts teach vital modes of seeing, imagining, inventing, and thinking. If our primary demand of students is that they recall established facts, the children we educate today will find themselves ill-equipped to deal with problems like global warming, terrorism, and pandemics. Those who have learned the lessons of the arts, however—how to see new patterns, how to learn from mistakes, and how to envision solutions—are the ones likely to come up with the novel answers needed most for the future. IN PRACTICE: How might Establishing Purpose be applied to an arts integration PD experience? This component does not necessarily kick-off the very beginning of a PD experience; many teaching artists engage classroom teachers in integrated arts experiences first, ask them to construct the meaning from that experience, and then connect that to what others say about teaching and learning through the arts. Framing the purpose can happen before, during, and/or after other instructional components. It may be tempting for a teaching artist to take on the role of an arts advocate and provide volumes of evidence to support his or her work. However, a focused, brief set of one to three quotes can be enough to connect classroom teachers to the wisdom of the field. By focusing on the learning targets of the professional development experience, the teaching artist may establish relevant connections in a succinct manner. For example, a focus on literacy may necessitate one or two quotes about reading comprehension, or cite a study in which students made gains on a reading test after learning through an art form. There are many ways to communicate support for arts integration including theory, research, policy, and anecdotal evidence, and sources may be local, national, or even global. Allowing students time and space to express themselves, to expel energy, to explore academic concepts through movement requires a paradigm shift within the traditional education system. Participants in the project have begun learning how they, as individual educators, can contribute to changing the learning environment to include all students. In essence, they are learning how to include every student, instead of leaving the alternative learners behind (p. 152). Movement is very helpful for ADHD and low level learners. The “Move and Freeze” or actions of the stories helped them remember more details, sequence, and recall with better comprehension. As part of the introduction to a 3-day drama/language arts integrated PD course, the teaching artist presents the following quotes to demonstrate three points: a) research supports the PD strategies and approach; b) teachers use drama strategies to help reach struggling students; and c) students are deeply engaged when learning through drama strategies. Researchers Rose, Parks, Androes and McMahon (2000) compared student outcomes from a drama-based reading program to those of a traditional reading program. Students in the drama-based reading program (the experimental group) participated in 10-weeks of theory-driven, research-based reading comprehension instruction that used drama techniques emphasizing imagery, elaboration, and story element segmentation. Students in the traditional reading program (the control group) received a traditional text-based reading curriculum. Results showed significant improvement in reading comprehension skills for the drama-instruction group in comparison with the control group. These findings provide evidence for a causal link between drama-based instruction and improved reading comprehension, and suggest that drama-based reading instruction may be more effective than traditional approaches in improving students’ reading skills. I have struggled getting students to interpret, explain their understanding, message of stories. By learning to use their imagination through drama, my students were engaged and more involved in learning the story. Student participation greatly improved for these lower level young students. I love drama! It is like a science experiment! After drama we write and draw about what we did! We clap hands, make sounds, play with our imaginations, read parts of stories, show how we feel when we say words, and answer questions! I didn’t know drama was so active! Ahhhhhhhhhhhhhhhhhhhhhhhhhhhhhhhhhhhhhhhhhhhhhhhhhhhhhh… I’M THANKFUL FOR DRAMA! 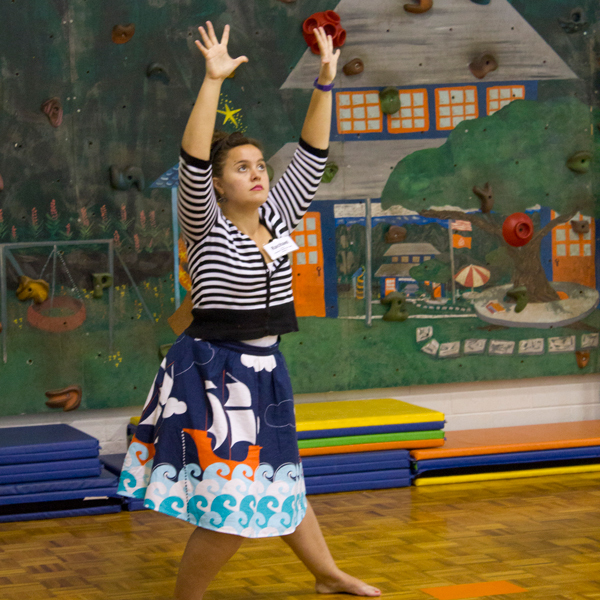 A teaching artist leads a two-hour PD experience on connecting arithmetic patterns and multiplication processes with music and movement. Students will learn to create choreography that demonstrates their understanding of concepts through musical and kinesthetic modalities. The PD experience gives teachers a preview of an upcoming ten-day residency and allows teacher to explore tools and strategies that they can learn and implement independently. The teaching artist outlines the purpose of the PD experience and the underlying rationale for the approach. Patterns are the building blocks of mathematics. We hear patterns in music, we feel patterns in dance. We can make connections between music, dance, and math. We can demonstrate our understanding by building choreography that illuminates the patterns in math and the correlating patterns in music. The rationale for the workshop includes the following. The approach encourages deep engagement for children. The approach involves students in creativity. These rationales and purposes are referred to throughout the workshop and reinforced in the course of learning activities and in final reflections. In particular, the argument for music and movement in this area is carefully built because it’s not an obvious connection for classroom teachers. The success of the workshop will depend on classroom teachers grasping the importance and efficacy of the approach. As part of a multi-year initiative to develop arts-integrated strategies, an elementary school participated in a series of full-faculty PD experiences. In order to establish purpose at the beginning of this process, the museum facilitators shared the following research example and teacher quote about the impact of arts integration on student engagement. During arts classes, the entire class was engaged and focused 15% to 30% more of the time than in their home classrooms, depending on which participating class we observed. Participating students were able to maintain higher levels of focus and engagement in their home classrooms for longer periods of time when compared to their non-participating peers. We could venture a modest case for the transfer of increased focus and engagement from the arts classroom back to the home classroom based on these data (p. 557). I was mostly surprised about the student’s engagement level. The students wanted to continue to read and research the Hot Spot Theory. Others loved drawing and sketching their understanding of fast processes. Overall, they were able to re-create what they saw and not merely record observations. They were able to gather and synthesize information by using art. Research differs from theory because it is based on systematic inquiry of human behavior. Some research tells the story of the power of the arts through numbers; quantitative studies succinctly and efficiently communicate student gains. For example, The College Board (2011) claims: “Students who take four years of arts and music classes average 100 points better on their SAT scores than those with less than one year.” Research findings are readily available through ArtsEdSearch, a hub for research about the impact of the arts in education. It is important to note that many quantitative studies are correlational; they point out patterns without actually claiming that the arts caused this increase in achievement or behavior. It is important for a teaching artists to avoid overstating the power of the arts or classroom teachers may have inflated, unrealistic expectations. Another valuable form of evidence comes from neuroscience and explains how the human brain reacts to a variety of stimuli; the Dana Foundation compiled an excellent resource entitled Learning, Arts and the Brain (2008) with a range of evidence from the field of brain research. Sometimes participants in a PD experience perceive a tension between arts integration and the serious business of school. Citing policy may encourage an educator to see that the arts are central to national goals. In 2010, Secretary of Education Arne Duncan said, “The arts can no longer be treated as a frill… Arts education is essential to stimulating the creativity and innovation that will prove critical for young Americans competing in a global economy.” Such comments may help frame the importance of a professional development experience in terms of national and global citizenship. The voices of classroom teachers and students in our own communities are powerful. Classroom teachers often write stories in their professional portfolios or final evaluations about what happened in their classrooms, what they learned, or what their students learned. Teaching artists may also have collected samples of student work or student reflections from their own classroom practice. Quotes from classroom teachers and students can be insightful and funny while simultaneously sending a message to participants about the real learning that is happening in schools and classrooms close to home. Anecdotal information from classroom teachers and students should ideally come from the teaching artist who is facilitating the professional development experience. It is important to note that the body of knowledge we share about learning through the arts is always evolving. Years ago, Gardner’s (1983) Theory of Multiple Intelligences was a popular way to talk about arts integration, however the theory has become conflated with learning styles, and research shows that tailoring instruction to cater to a learner’s preferred style is ineffective. Recent brain research suggests that increasing options of representation, engagement, and action reduces learning barriers within classrooms through Universal Design for Learning (Glass, Meyer & Rose, 2013). The idea that the arts provide powerful pathways for learning by increasing variety in the classroom is present in both theories. It should be noted that current research is constantly revealing new effects of the arts, and policies may be in flux with changes in leadership.